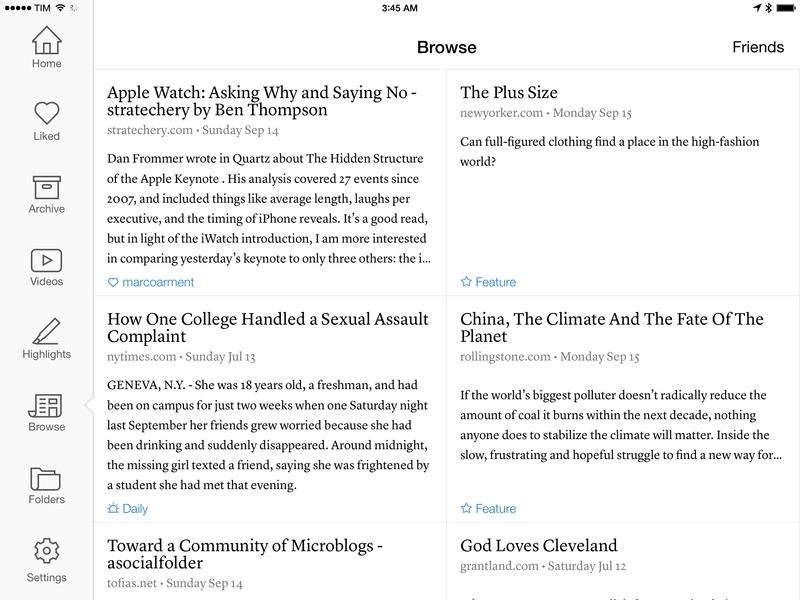 Instapaper is an app that lets me read more. For the work that I do on this website, Relay, and, lately, a weekly newsletter, I have no shortage of links with interesting facts or opinions that I want to consume and absorb. The problem isn’t quantity; it’s attention and time. And Instapaper, thanks to a thoughtful design based on a clear focus and goal, makes me want to read more and carve out time for reading because it is designed for one element: text. Instapaper respects text and the person who reads it. I’ve tried many read-later solutions over the years. For a brief period of time, I switched to Pocket – a fantastic app that can save almost anything for later. Then I tried to simply leave tabs open in my web browser, thinking that permanence and tab sync would be enough to shame me into reading and closing those tabs. I thought that Reading List – another solid addition to Safari with a nifty system integration and reliable iCloud sync – would solve the problem of not reading what I was saving. I tried to star every article that I wanted to read in my RSS reader, and that didn’t work well in the end, either. For a couple of months, I even kept a Markdown list of links I wanted to read. I came back to Instapaper earlier this year, after Marco Arment sold it to betaworks and after I worried that its owners would turn it into some kind of Techmeme or news aggregator. I realized that Instapaper works for me because its design and features accomplish an obvious but arduous task: they make words by others feel like something I want to read rather than an obligation or an unread badge that needs to be taken care of. Instapaper is built with the experience of reading in mind rather than the mere technological feat of being able to save articles on any platform. Some articles don’t even look that good in Instapaper. But the environment that the app creates and the sense of reading that it transmits are, for me, far superior to any fancy interface, third-party integration, or iCloud-only perk that I may get with other services. There are many great read-later apps, but Instapaper is what feels best for me. 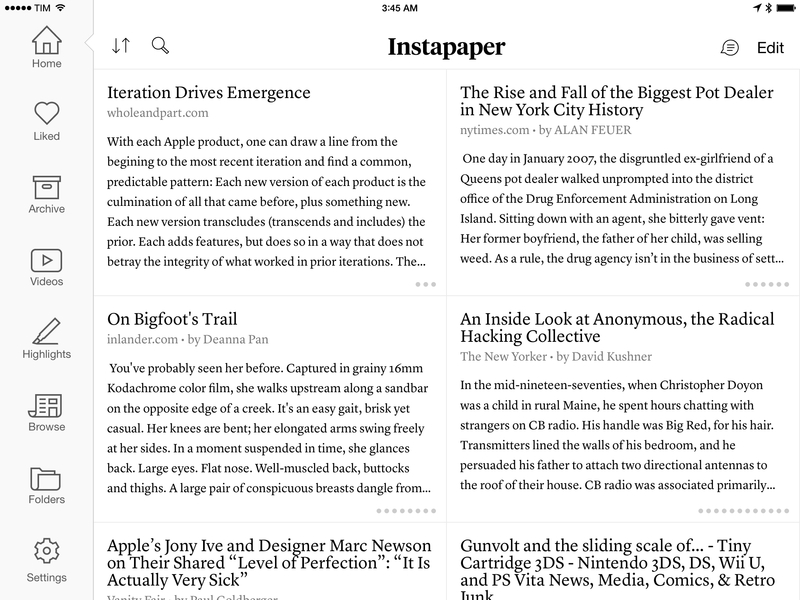 With today’s launch of iOS 8, betaworks is introducing a major update to Instapaper: version 6.0, available on the App Store, makes Instapaper free, brings changes to the Browse section, adds a Today widget, and includes a sharing extension to save articles from anywhere with two taps and no more bookmarklets. I’ve been trying Instapaper 6.0 since last month, and while the reading experience and structure of the app are the same, its iOS 8 enhancements make it feel like the Instapaper I always wanted. And more importantly, the features that betaworks added and their plans for Instapaper’s future suggest that I made a good decision in switching back to it. Since the beginnings of the App Store, Instapaper had to rely on a browser bookmarklet to let users save articles from Safari to Instapaper. The bookmarklet worked, but the installation process was cumbersome, annoying, and it required people to swipe through screens of instructions that could be easily misinterpreted. With time, Instapaper – just like many other web services – started appearing as a custom sharing service in native apps (such as Twitter or Reeder), but because of the lack of a unifying sharing layer throughout the OS, implementations varied and you needed to log into Instapaper every time. Perhaps your favorite RSS reader displayed one kind of Instapaper dialog, while a Twitter app showed no Instapaper interface at all. Third-party integrations worked, but the experience was crude. With iOS 8, betaworks has been able to add the Instapaper sharing service the app deserves: with a native sharing extension available in any app that supports the system share sheet, you’ll now be able to save an article for later with two taps. No bookmarklet to install, no need to ask developers to support Instapaper manually: once activated in the share sheet, Instapaper will show up as a sharing option anywhere it can (read: in places where URLs can be shared). Betaworks could have made the Instapaper extension for iOS 8 a custom-designed sheet, but instead they went with the simplest possible approach: when you save to Instapaper, you’ll get the same confirmation screen of the bookmarklet…and that’s it. You won’t have to tap buttons or interact with menus as Instapaper’s new extension is a one-tap deal to save links for later and forget about them. Instapaper's new saving process: extension, widget, and article. At first, I was put off by this basic approach, but the truth is – it works exceptionally well for Instapaper. Whether I’m in Safari, a Pinboard client, or a news app, I can tap a button to save articles and I get a consistent UI that doesn’t require me to authenticate with Instapaper multiple times and that “just works” because the app provided the extension. This is one of the many advantages of iOS 8. 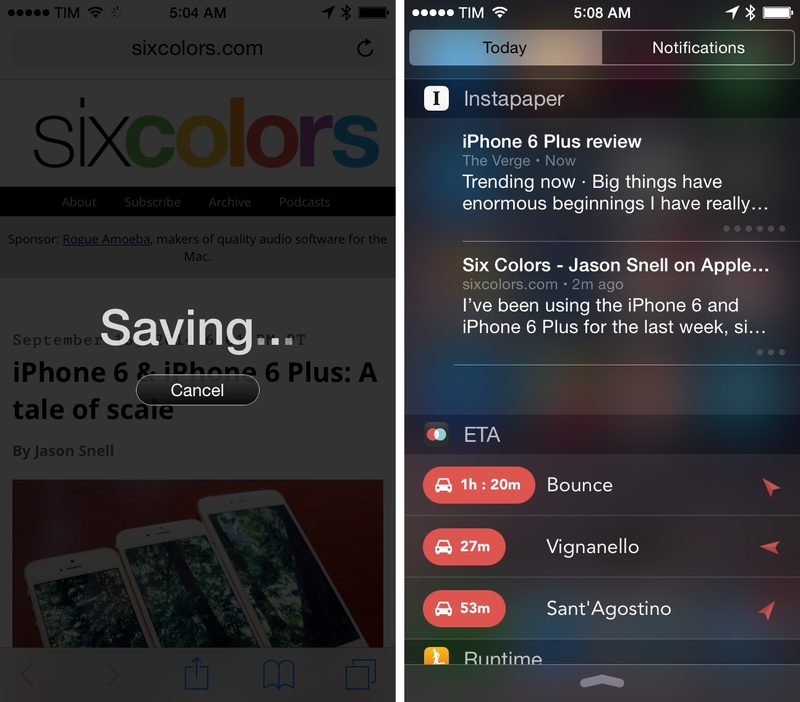 The second extensibility-related enhancement to Instapaper on iOS 8 is a Today widget that shows you articles you’ve saved today in Notification Center. The widget is straightforward and easy to interact with: if there are articles for the current day that have already been downloaded by Instapaper, you’ll get a tappable preview in the Today section. Tap an article, and you’re taken to the app. I haven’t used the widget much as my Instapaper habits aren’t based on what I have to read today, but I think it is a nice extra. When reading in Instapaper for iOS 8, you’ll get a native share sheet with support for extensions by other apps. In my tests, I was able to save URLs from Instapaper to other apps using extensions, but because Instapaper shares the title, URL, and “via Instapaper” as a string of text, some apps that can only receive links couldn’t be triggered by Instapaper. 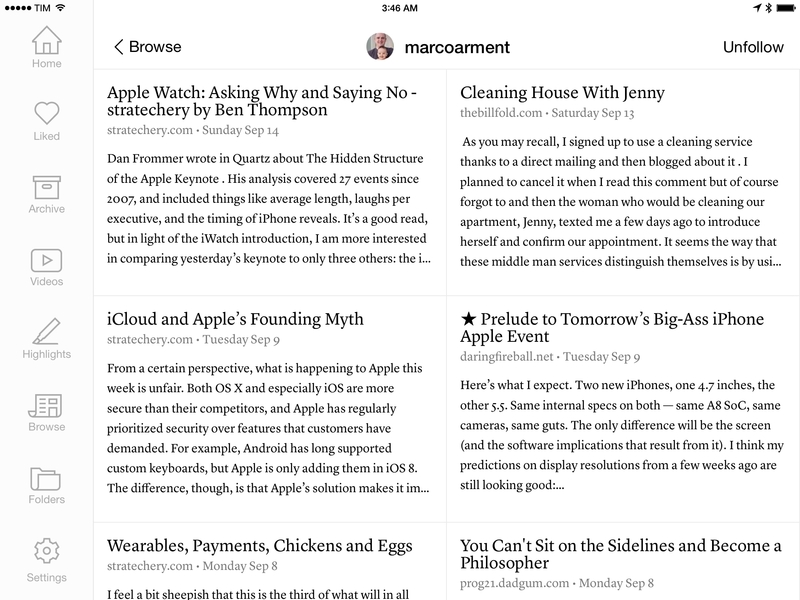 One of the big advantages of Instapaper’s read-later approach over basic solutions such as Apple’s Reading List is a discovery aspect that lets you find new articles through friend recommendations and curated lists. While Reading List works as a glorified bookmaking system with deep Safari integration, Instapaper’s Friends section and picks from The Feature help make the app feel like a community, which betaworks wants to highlight with a unified Browse section in Instapaper 6.0 and the addition of public profiles. In the new Browse page, you’ll find a stream of recommended articles with blue badges that indicate whether the article came from on your friends (people you follow), The Feature, or Instapaper Daily. You can tap on the blue usernames to view profiles and all articles from that source; for friends, tapping their name will reveal a public profile with an avatar and a stream of previously liked items. Instapaper’s Friends functionality has often been regarded as a social network that exists within the app with no strings attached, and the addition of public profiles may corrode that sense of ease and comfort that you get when you like an article you’ve read. In the old Instapaper, you knew that only people who followed you could see the liked item and there was no online presence to manage. Brian Donohue, lead iOS developer for Instapaper at betaworks, told me that they know they need to keep Instapaper’s delicate balance of offline reading with basic social components, and he added that betaworks thought deeply about how to merge friends with other sources and the best way to enable public profiles without annoying a portion of the existing userbase that doesn’t care about Instapaper’s built-in social network. The interactions with user profiles are indeed kept to a minimum, and there’s a simple switch to make your profile public or private. You can follow and unfollow people, but you can’t even tap on their profile pictures to enlarge them. You can’t have interactions with other friends and you can’t post non-like updates. In practice, little has changed from the old Instapaper, but it’s easy to imagine how betaworks could take advantage of user profiles to do more interesting things. I’ve always wondered, for instance, how Instapaper could showcase friends’ tastes and reading habits (e.g. I read about videogames a lot and often save articles from The Atlantic), or if, eventually, more curators could have officially curated lists on Instapaper that you could subscribe to instead of The Feature. Instapaper’s profiles could get a lot more interesting without ruining the passive, non-creepy nature that the Friends section has become well known for. I wasn’t sold on the idea of a unified Browse section initially, but, a few weeks into Instapaper 6.0, I think that it makes sense to have all my recommendations in a single place – sort of like a Twitter timeline full of great reads. I’m curious about betaworks’ plan for the future of user profiles, and I would love to see more curators in the app. In addition to extensions and changes to the Browse section, Instapaper 6.0 adds native support for 1Password and the possibility of listening to articles read aloud by Apple’s built-in speech synthesizer. The 1Password login extension works as you’d expect: you tap a button in the login screen, Instapaper shows an action sheet, and, after tapping the 1Password icon, you’re presented with a lock screen. Authenticate – either via Master Password or Touch ID – and you’ll be able to fill-in your Instapaper credentials directly from the app. 1Password integration through the extension is one of the most glorious aspects of iOS 8, and it works as advertised in Instapaper 6.0. Speak is interesting. In the Home screen, you can tap a button to show a new option called Playlist that lets you pick articles to play. Multiple articles can be added to a playlist if you’re a premium subscriber, and Instapaper will automatically advance to the next article upon finishing the previous one. Things are fairly obvious in the Playlist screen. There are playback controls at the botton, a progress bar on the article that is currently playing, and a button to adjust reading speed. The default system voice is used to read articles, which means that it sounds a little robotic, but it’s passable. I don’t use the Playlist feature, but I think it’s a good addition in terms of Accessibility and for people who want to catch up on their articles while driving. Instapaper 6.0 is a solid update: the refreshed Browse section offers a unified feed of article recommendations, while the sharing extension makes it easier to save links from anywhere without worrying about bookmarklets or third-party support (as long as apps use the native share sheet). It’s Instapaper Premium, however, that will be crucial to the future of the new Instapaper run by betaworks. The new name of Instapaper subscriptions, Instapaper Premium signals betaworks’ intention of growing the service’s userbase while generating revenue with premium features and users who want more out of Instapaper. The strategy is twofold: starting today, Instapaper will be free on the App Store (for the first time since Arment pulled Instapaper Free in 2011) with Premium becoming a $2.99 monthly subscription (up from $1) or $29.99/year. Pocket, which relaunched as a free app over two years ago, also offers a Premium option at $4.99/month with advanced search features, offline copies of articles, and more powerful tagging options. “Our goal with the price increase for Instapaper Premium is to accelerate the pace of feature development and further improve support for our customers”, Donohue told me in our conversation. “The Instapaper team, betaworks, and Marco all feel that this is the best path forward for Instapaper. By making Instapaper free, we’re eliminating its biggest barrier to sign up”. The freemium approach taken by many (Evernote, Dropbox, and, soon, IFTTT) might as well work for Instapaper, which now offers a revamped web experience, deeper integration with iOS, and that shows potential for interesting additions in the Browse area of the mobile app. Converting free users who just want a clean read-later utility for temporary articles will be tough, and betaworks will have to prove that a great reading experience with discovery features – not just glorified bookmarking – will entice users to try Instapaper and subscribe. Instapaper 6.0 is available on the App Store.